The DC SSR is a simple, yet effective design. In the beginning of Xmas lighting automation, the primary lights used were mini-bulb strings. They were operated from 120 or 240VAC primary voltages, or from a secondary voltage such as 24 or 36 VAC. There were a number of Solid State Relay designs, and I produced my version - the SSROZ and the SSREZ. In 2008, I was approached by Scot to see if we could developed a DC Solid State Relay board so he could control LED floods and strings. He was putting together a Halloween show and wanted to use some MR16 LEDs for color floods and fills. The board is designed to work with a number of DIYC boards such as the RENARD64, the GRINCH, and any other controller that provides the same interface. The board is a simple design, and follows the standard connection for an AC SSR COOP board. The RJ45 Socket provides the connection from the DC SSR to the Controller. The LED on the board indicates 5VDC is being supplied from the Controller to the OPTO. The OPTO, which is different to the MCO3023M used on the AC SSR, is a K84PH, 16 pin DIP IC. I purchased mine from Mouser. 782-K847PH was the Mouser Part # and they cost $1.02 each, and here is the Datasheet The OPTO provides DC isolation from the Controller to the DC load. this is a safety feature, though some would suggest it could be deleted, I felt that will storms and electrical noise, it makes sense to isolate the PC and controller from the Lights. The load switching is provided by MOSFETs. The original MOSFET used was a STF20NF06. Mouser are no longer stocking this part. An alternate part is the FQPF13N06L. 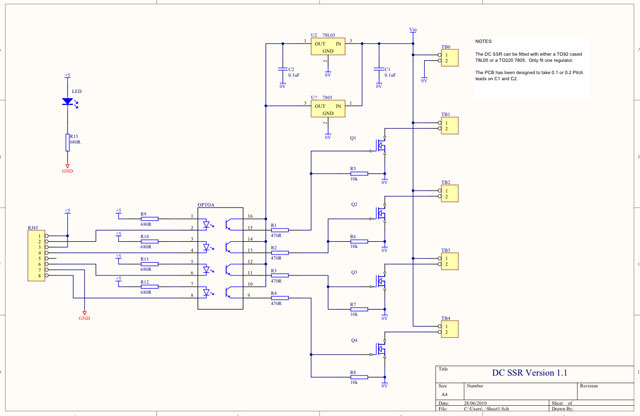 There is a regulated 5V DC supply for the OPTOs, provided by either a 7805 or a 78L05 on the PCB. the PCB has mount holes for the TO-220 or TO-92 case style. Many of the Linear Regulator datasheets recommend a small value capacitor be connected across the INPUT and GROUND of the regulator. Fairchild state that " C2 is required if the regulator is an apreciable distance from the power supply filiter". C1 improves 'stability and transient response". Euro style screw connectors are specificed for the board, and they are grouped in pairs (+/-) to make connections easy. Here is a schematic diagram. Click on the image to open a PDF version.